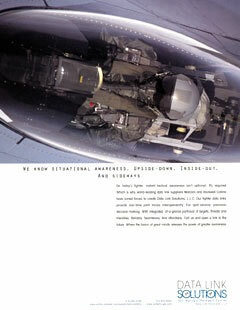 Ad for Data Link Solutions - a leading supplier of terminals and systems-integration and support for air, land and sea-based platforms, primarily for the military. Headline reads: "We know situational awareness. Upside-down. Inside-out. And sideways."